I have a VPS and would like to run a public node and get it indexed by moneroworld to help the network. I made the necessary changes to monerod.conf to change the port to 18089 and to restrict things to keep people from mining on my system. 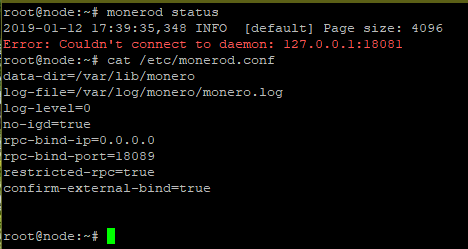 But whenever I use monerod to check the status, it keeps trying to connect to port 18081. See screenshot below. My node is currently running (209.159.146.140:18089) and I can connect to it directly using wallets on different systems just fine. But I keep getting the above error when running monerod status. The default config file location is actually in ~/.bitmonero/bitmonero.conf, so if you are using another location, you need to start the daemon with --config-file /etc/monerod.conf in your case. Not the answer you're looking for? Browse other questions tagged monerod full-node nodes or ask your own question.